So, not only does our Child Blue Stealth Ninja Costume come with everything you need to begin scaling rooftops at night, it looks super cool as well. Keep in mind that we have similar costumes in different colors, perfect for the latest ninja collective to terrorize the streets. Swords are, unfortunately for him and fortunately for everyone else, absolutely not included. You better keep an eye or two on him, though. This costume tends to bring out the kung-fu master in anyone and everyone! This costume comes with just about everything for a ninja-in-training. A hood jumpsuit secures with a snap of Velcro at the center back to keep everything fastened, and it comes with attached arm and leg ties and even a foam belt, face mask, and foam throwing stars. All-polyester, this costume will have him ready for a memorable Halloween. A word of caution: among the most difficult of paths, especially before having graduated middle school, is the way of the ninja. Bopping and weaving and darting to and fro, mastering the arts of Kung Fu, Karate, and Jiu Jitsu, weapon proficiency—it's all part of the Secrets of the Shadow. It doesn't help that there are so many weapons to master: throwing stars, of course the katana, and silence itself. Finally, you absolutely must learn to dress yourself in the proper attire, so you are feared by your enemies and respected by your fellow ninjas. 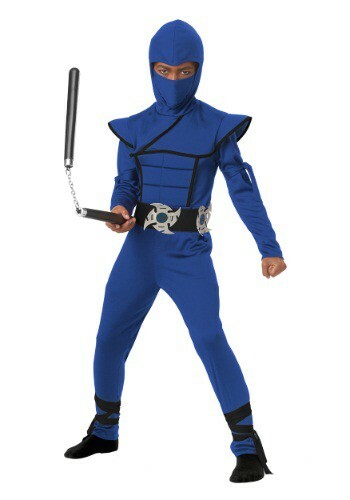 By proper attire, we mean this Child Blue Stealth Ninja Costume! Your little dude will master the art of stealth one way or another in this costume, and best yet he'll have a blast doing it. Best of luck on his path to being a full-fledged Ninja!